Mini Brunchshop! Our First Ever Creative Workshop. I’m super excited to tell you that in a few short weeks, I’ll be hosting our first mini brunchshop with DeLallo Foods! Brunch + creative workshop = brunchshop. We’re talking food, styling, photography, entrepreneurship, passionate creativity and L.O.V.I.N.G. your work. It’s a thing! For years (seriously… years), I’ve wanted to bring together small groups of like-minded, creative people who are in love with what they do and can’t stop talking about and sharing what they do, in the best way ever. For our first brunchshop, we’re focusing on food styling (and will be in a beautiful open space to do so! ), some naturally-lit food photography tips, iPhone photography(! ), breaking out creative ruts and working towards finding success as a blogger and entrepreneur. I am SO excited I can hardly stand it. And I would love for you to come! Registration starts NOW and we’re keeping it small: 12 people only. what we’re focusing on: food styling, photo props, food photography tips, iPhone photography, successful authentic blogging, sparking creativity and cultivating an entrepreneurial spirit. where it’s at: our first brunchshop will be hosted by DeLallo Foods, at a location near their retail store, about 30 minutes east of Pittsburgh. Exact location details will be sent once you’ve registered. Anyone is welcome to attend; travel accommodations are your own responsibility. Register HERE. Only 12 spots are available! Registration is not refundable. 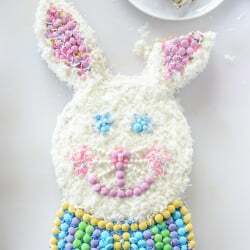 Confetti Coconut Classic Bunny Cake with M&M’s. So cool, wish we lived in the same country so we could attend! Anyway, love the idea! I love this idea – I am sure it will be a hit!! Can’t wait to hear about it and hope to see more workshops down the road! love this! do you have to have a blog and/or business to attend? I wish it wasn’t so far so that I could go! Looks like such a fun event and hope you have a great time. Just registered – I can’t wait! That’s my daughters 16th birthday……16 on the 16th in 2016! Desperately wishing I was on that side of the country! Oh man, so close yet so far!!! I’ve really gotten into food styling lately, any chance you’d consider doing online tutorials on the topic for us out-of-towners? ah so bummed to miss this! I live in Pittsburgh but that’s the one weekend that I’ll be out of town. SO hope you do this again!! This is so cool! Love that you guys are hosting this! OT but speaking of Pittsburgh, I’m going to be moving there in a few weeks and was wondering if there was any blog posts you have written on your fav eating spots around the city for brunch, dinner, coffee, desserts, etc. I’d LOVE and appreciate any recs from you! I follow your snap and insta so I’ve been trying to scour those for places you’ve mentioned before. Thanks!! This sounds awesome and I definitely want to try to get to one. Any idea how often you might be doing it? Oh man!!! If I wasn’t still BF’ing a 3 month old every 3 flipping hours I would sooooo be there! I hope you have more in the future!!! when are they going to send you on the road? maybe to dallas, tx?? Just bought my ticket! Can’t wait!! Congrats! You’re a fountain of creativity, they’re in for a treat! This is totally not workshop related, but I was just googling “S’mores Dessert Recipes,” because…well, what night isn’t a good night for a S’mores dessert? Anyway, this article came up, and I realized I totally should have just searched on your site, because the article is mostly links to your blog. Deciding between 3 of your many delicious-looking options. Thanks for ensuring that my late-night S’mores cravings will be satisfied. Any chance you would host a web version of this for your out of town followers? I would be the first person to register if you did one in San Francisco!!! Wow! Congratulations!! I so wish I lived closer! What a great idea! Thank you for bringing this to Pittsburgh! I’m bummed it’s sold out :( hopefully you do another one! HAVE more, please! it was sold out by the time i clicked on it. such a cool concept, i absolutely would attend the next one!!!! I want to echo some of the other comments – I just went to sign up and found out it’s sold out! I’d love to attend the next one and hope I get the opportunity if you host another workshop! Oh my god. This is soo exciting. If only I lived in the East Coast! Omg, I wish I lived in Pittsburgh!!! Can you please do one of these workshops virtually???? I live in San Diego Ca. I am a Chef/caterer and worked for 30 years as such. I would love to take the class! Are you able to come to San Diego some time? What a great idea – good luck! I’m not a photographer so I would hate to take a place that someone else could really use, but I would love to be a fly on the wall to hear everything. Your photography is always so nice, it would be interesting to hear more about how you do it. Have fun! Sounds like a blast, and Delallo are perfect for it :) Good luck! I’m sure this event is going to be epic one, enjoy it! How fun! I wish I was still in Philadelphia I would love to come! I’m so happy for you and wish you the best of luck!! We are way to far. But enjoy!! Come to NY!! So wish I could come to this! Wow! I love Dellallo’s and I just saw this today and wish I knew about it earlier but money is also tight but I hope you do more of these as It is in Jennette and thats is close enough to me I can actually go there vrs somewhere in Downtown Pittsburgh so I will try to save up and hope you do have lots more of these and I will be there.